The Esplanade on the New River has redefined Fort Lauderdale's Landscape. 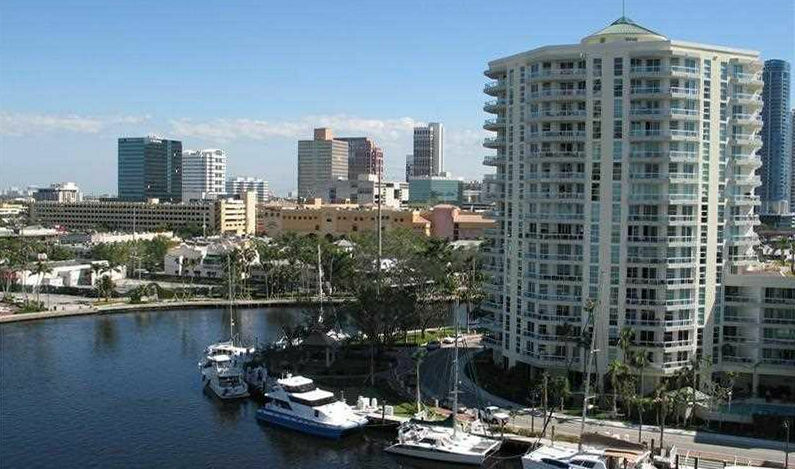 Located in the Sailboat Bend neighborhood, Esplanade sits at a dramatic bend on the New River across from the Broward Center for the Performing Arts and Riverwalk. It is located along South West 4th Avenue a few blocks west of Andrews Avenue. Water taxis are available to get you to downtown in minutes. Esplanade offers views of downtown's skyline as well as the river and Atlantic Ocean. Dockage is available on the New River. The porte-cochere entrance features a waterfall and brick paved promenade. Building features include a heated pool and whirlpool spa, tennis pavilion with two lit courts, fully equipped health and fitness center, poolside barbeque and entertaining pavilion, and garage parking for residents and guests. All units come with one deeded parking space. The largest units have two spaces. Pet owners: Esplanade permits two pets per unit with a 40 pounds (each) size restriction. Each residence includes voluminous 8' 5" ceilings, spacious terraces with tinted glass railings and floor to ceiling tinted sliding doors, ceramic tile baths, deluxe washer and dryer in each unit, oversize walk-in closets, Whirlpool Gold kitchen appliances, granite countertops, euro-style cabinets and more.